So last night I put on the argan oil/tea tree oil mixture before I left for work. I am giving my face a little break from the Nu-stock, my face seemed to have a slight pink ting all over and it was super drying and my face just needed a break. Okay back to last night, so I brought my oil with me to work and whenever I felt one moving making me insane I put some oil on it. 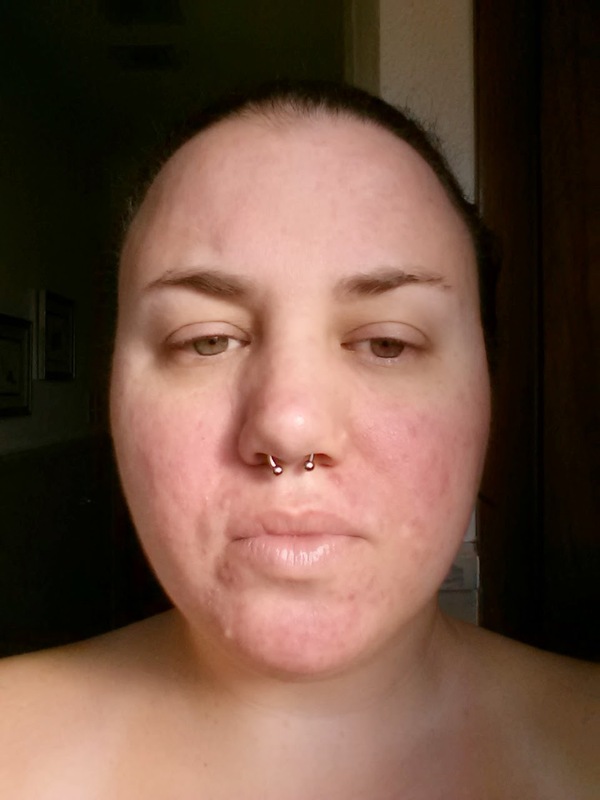 My face is much paler than it was but it is still pink, especially on my cheeks but I think a lot of that is broken capillaries that I need to have zapped again. My forehead is still covered in a bazillion bumps that itch like crazy and I have gotten a bunch behind my ears that itch too. 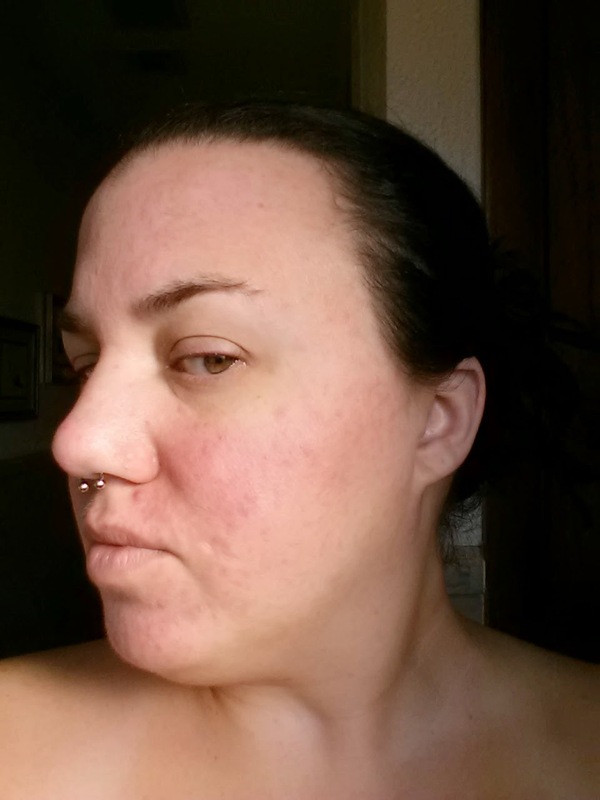 Another reason I am giving my face a break from the nu-stock is I can tell that the chemicals were burning my skin a little because I looked like a wearing a slight pink mask and my skin was pale around my eyes. It isn't enough for anyone else to notice but I could. Did I mention my forehead itches like crazy? Later today I am going to take a borax soak in the tub, but for now pictures. I am not going to do the up close ones because there is nothing to see. 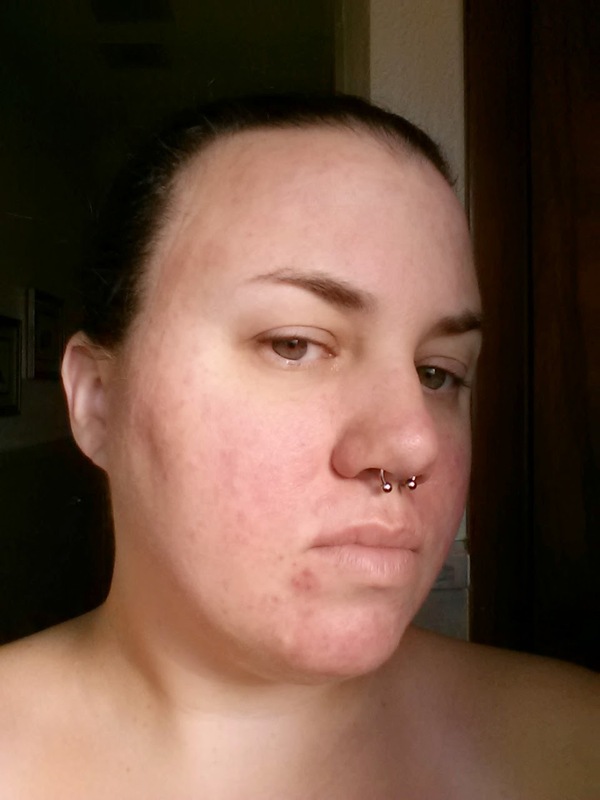 I don't have any new pustules just a pimple, well on my face anyways. I am starting to get some on my chest, hence the borax bath. So weird that I can say I have no new pustule. On to the pictures, sorry I look like I am in pain, the sun was shining in my eyes.